Not long ago, I told you about my sister’s mother-in-law and her delicious pitacella. Nina’s food was always truly amazing. Every Christmas, she’d surprise her large crowd of guests with a different main course…goat, rabbit, quail…no matter what, you knew it was going to be special. And don’t even get me started with her lasagna. There were many dishes of hers, however, that I wasn’t fortunate enough to try while she was still with us. I noticed a picture of one after my sister’s recent trip to Italy. She was on her biennial trip with her husband, daughters, father-in-law, and brother-in-law Tony, visiting Nina’s family. Whenever they go, they’re brought back to Nina’s home cooking, courtesy of her sisters and cousins. The picture that Tony posted immediately made my mouth water. I asked him to describe what it was, and knew right away that I needed to make it ASAP. His cousin made it while he was in Italy, but it was a dish that he said Nina made often. He had an idea of how she prepared it but wasn’t exactly sure, so I did my best to replicate it. Well, as expected, it was delicious! After all, what could be bad about mozzarella and prosciutto sandwiched between juicy fried eggplant? 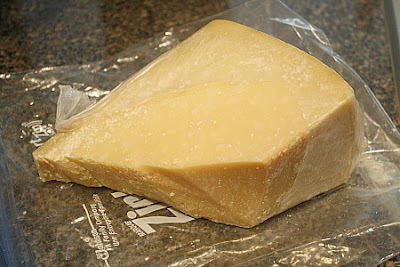 Especially when the king of all cheeses is involved – Parmigiano Reggiano. Preheat oven to 350 degrees. Crack eggs into a bowl and beat with a bit of water. 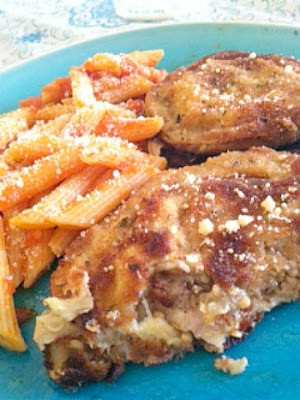 Place bread crumbs on a flat plate, add a bit of Parmigiano Reggiano, and mix. Dip eggplant slices in egg, one at a time, letting excess egg drip off before coating both sides with bread crumbs. Heat oil over medium-high heat in a large skillet. Add eggplant and brown on both sides, sprinkling with a bit of salt and pepper. Remove and place on paper towel lined plate. Repeat process until all eggplant is cooked. Lightly oil a baking pan. Place eggplant on bottom. Top each slice with a few slices of prosciutto, then mozzarella. Top with eggplant and sprinkle Parmigiano Reggiano on top. Bake for about 12-15 minutes, until cheese is melted. Top with more Parmigiano Reggiano, if desired. Serve. Makes around a dozen “sandwiches”. 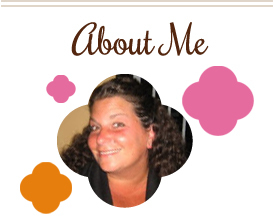 This entry was posted in eggplant, family, Italian, main dishes, mozzarella, pork. Bookmark the permalink. 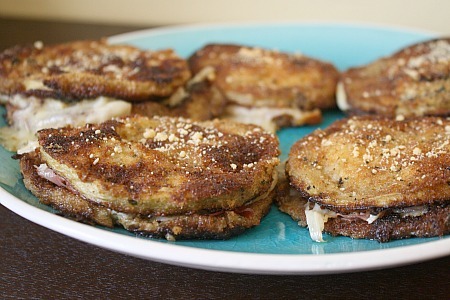 4 Responses to Eggplant, Prosciutto & Cheese "Sandwiches"
These look awesome. I can’t wait to try them! I’ve realized I only like eggplant in Italian dishes so this is right up my alley. It would be great if you linked this in to Food on Friday: Ham. Have a super weekend. PS I’m sure you have been busy but it would be great if you followed Carole’s Chatter back.